Aldi launches a remarkably cheap turntable for Mother's Day | What Hi-Fi? Costing £60, Aldi's turntable is competing with the Crosley Bermuda Dansette and the UO X Dansette Red. It has three speeds, built-in stereo speakers and can record vinyl to USB or SD card. With Mother's Day fast approaching (it's the 26th of March, don't forget), Aldi has announced what it thinks is the perfect present: a £60 "Freestanding Retro Turntable". 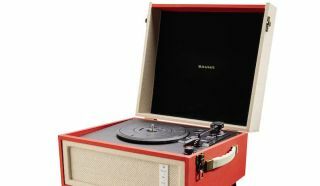 The turntable is apparently "almost indistinguishable" from the Crosley Bermuda Dansette, currently priced at £300, or the £250 UO X Dansette Red record player. Aldi's record player has three-speed playback and built-in stereo speakers, as well as an RCA line out. It also has a rechargable battery, headphone jack, and can record LPs to USB or SD card. Which is a full suite of functionality at the price, no question. Of course, this isn't the first time Aldi has come by a low-cost turntable. Last year the supermarket promoted a £30 player, which undercut Lidl's own version by £20 - possibly fuelled by the amount of vinyl available at other retailers like Sainsbury's. This record player is part of Aldi’s "Specialbuys [sic] Mother’s Day Gifting range", which also includes a "weather station" and "Professional Hairdryer". The turntable will be available from 16th March, and can be pre-ordered from 9th March.